3M™ Digital WorkTunes™ Hearing Protector and AM/FM Stereo Radio, featuring Voice Assist, used to help protect ears against noises. MP3 or scanner compatibility and hearing protector all-in-one. With digital tuning and voice assist, you can easily hear and adjust to your favorite station or song while protecting your hearing. 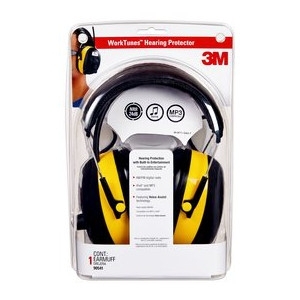 Lightweight, comfortable and fully adjustable, 3M™ Digital WorkTunes™ Hearing Protector is a great choice in hearing protection, inside and out, for both the pro and DIYer.